There are so many recipes for plum cake. You can make it with a shortbread crust or with yeast, you can use streusel or let the plums sink in, you can make a sheet cake or use your spring pan. Personally I like yeasted sheetcakes. They are simple, not too sweet and full of fantastic fruits. But usually German recipes for sheet cake make way too much for a two person household. Even if you are invited somewhere and bring the cake for coffee, your hosts need to invite the whole neighbourhood over to get rid of the leftovers. A very simple version of plum sheet cake is called Zwetschgendatschi. This is a yeasted cake with lots of plums on top. Where I come from a Zwetschgendatschi would simply (okay, to you this might sound as complicated) be called Pflaumen(blech)kuchen (plum sheet cake). It is made with yeast and baked on a large baking sheet. As I said before, I could feed half a village with such a cake, so I halved the original recipe which I took from a German vegan baking book. I also changed some of the ingredients and added streusel, to make the cake look pretty. The cake itself is only slightly sweet. You can increase the sugar to 1/2 cup if you like. 1 lb plums (pitted and halved), similar to those shown above. For the streusel, I used the streusel recipe for my rhubarb cake. Grease a 10 inch springform pan with vegetable oil or shortening and set aside. In a bowl mix flour and yeast. Add reamining ingredients and stir well. Knead the dough for ten minutes until soft but not sticky anymore. The texture should be like bread dough. Adjust amount of flour or water, if neccessary. Cover bowl with a damp kitchen towel and let dough rise in a warm place until doubled in size (3/4 to 1 hour). Meanwhile wash and halve the plums and prepare the streusel topping: In a bowl mix flour, baking powder, and sugar. Add margarine and vanilla. Use your hands to mix until mixture starts to form into crumbs. Add soy milk if too dry. Transfer to oven and bake for 30-35 minutes until golden brown. Let cool for five minutes, transfer to a rack and sprinkle with confectioner’s sugar. Serve warm or cool. If you have vegan whipped cream sitting in your cupboard, this would be the perfect opportunity to use it. This recipe was submitted to Susan’s YeastSpotting. I got this made for my birthday. It was soooooo delicious!!! Sadly, the bottom ended up tasting like bread. It wasn’t very sweet and not cakey at all. The topping was OK but I added a couple Tbsps of sugar to sweeten it. Not a fan of this recipe (no offense). Sorry you didn’t like it! This kind of cake is definitely very different from US versions, denser and also not as sweet. The yeast dough gives it a very different texture. I mentioned that this cake is only slightly sweet in the description. You could have increased the sugar in the cake itself, too. This looks so lovely! I was wondering if you had a recipe for a shortbread crust at all? My oma always makes it that way and I’d love to make a vegan one for her! Yes, some of the pies in the cake section (recipe index) are made with shortbread crust. Thank you so much for putting this up. I grew up eating this cake and felt bad that I never asked my mother for the recipe and have been hunting for one that was similar to her with a streusel topping. Vielen dank. Thank you, Patti! I have never been to Schweinfurt. I have to visit it one day. This is so gorgeous! I love the crumbley top surrounding the plums. I made this and completely f’d up the ingredients, but it was still pretty delicious. Planning on making it again with accurate measurements! If it helps I could give you the metric measurements for this recipe. Ich bin so wild nach deinum kuchen! I’m in Berlin now and the place is rampant with plums! This is a definite must-try! My mother Helga, was from Berlin and I was born in Schweinfurt. This plum strudel looks so yummy, im use to the traditional apple strudel, perhaps i should be more creative! Thank you! This is not a strudel at all, but a plum strudel sounds like a gret idea indeed! I just love plum yeasted-dough sheet cake with streusel. As I’m from Czech republic I assume our version is quite similar to that German (although I see some small differences in the recipe) and it’s so easy to veganize the traditional version. But once I made it I ate more than half of the cake just few hours after I took it out of the oven :( so halving it is definitely a good idea. We also make the same cake with blueberries or blackberries. Your plum cake looks delicious and exactly like the version which is sold here in Saxony. I learned to make it on a muerbteig, with the plums cut in 1/4’s and sliced so the peel is pushed into the dough. It makes nice little rows for a sheet cake. Then it is sprinkled with a little cinnamon sugar after coming out of the oven. Your recipe looks lovely – I’ll have to try it. We call those “Italian plums” in Oregon :) They are coming ripe soon here. 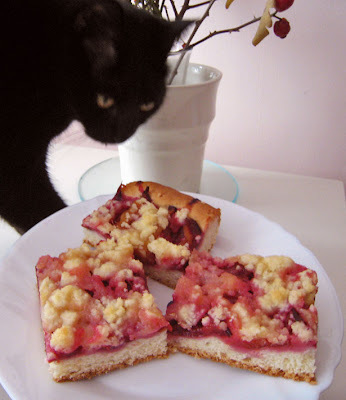 Yum, I love plum kuchen! Just the thing to make in September . . . I usually make it without yeast, but now I want to try it your way! Mihl, that is a great looking cake! Plums are so good and I like that you didn’t sweeten them too much. The whipped cream would really make it perfect. I was a little surprised a half recipe went into a 10 inch pan. I believe you when you say a whole recipe would feed the neighborhood! Make that a wonderful touch. I love this! These plums look like what we call prune plums here, small and sweet. And the streusel topping is a wonder touch. Thank you for the explanation! I was looking for the right translation, but didn’t find anything. this looks delicious! Thanks for sharing, I’m always on the look out for great vegan recipes. You always have the most elegant recipes (with pretty pictures)! yummy!! not too sweet and full of whole fruit? that’s so up my alley! Thanks, Mihl! It’s definitely one of my dreams to one day have my own. mm…you just half these and put them straight in??? YUM… I might have to try a pluot cake before the seasons over… I can’t tell by your pictures… about how small are those guys?? Yep, that’s how it is usually done. They are much smaller than the average American plum, I think. One weighs about an ounce and is a little bit bigger than a walnut. you always make the yummiest baked goodz that i have never tried before, Mihl! i cannot wait to make your plum cake! it looks absolutely heavenly! ooooooh my gosh – mmmmmmmmmm! Vielen Dank für das Rezept und linguistische Erklärung! Es interessant mir, die Kleinigkeiten des Sprache zu lernen. I’ve never had plum cake before…it looks so pretty!!! Wunderschoener Kuchen!! Und wir Oesis sagen auch Zwetschken! I love that this recipe is really popular on line at the moment! I found this really, really, really nice warm. It really kicked up the comfort food feeling. Oh my goodness, what a beautiful cake! I’m pretty sure I could eat half of the halved recipe :) I might have to quote your linguistic lesson on the linguistic/translation blog I write for–I’m all about food whenever I can think up a topic! That blog sounds interesting! Do you have a link? This looks so yum! I love plums so much, and I just love that they are in season. Ok, what is your thesis in, by they way? Because I love your explinations! You caught me. It’s right in that field, but not about a linguistic topic. I stick with literature. PLUMS!! My favorite summer fruit.